Technology has transformed the way we do business. We are in an age of automation where everything, right from planning to marketing is automated and is just a matter of a click away. If you want the world to know your company and your offerings, you need to make yourself active on online channels. Having a website, being active on social platforms and reaching customers via emails will just serve your purpose. While automation has been successfully reducing the workload for large enterprises, small businesses still find it risky or unreliable. But let us tell you that there is nothing to worry. We know that you are new to the industry, but that doesn’t mean that you can’t make use of modern technology and refrain yourself from it. Automation has a hell lot of advantages. Not only it ensures that your work is done fast and at the right time but also it gives you the ease of enjoying your business and letting you focus on goals. We all know that email marketing is the most happening thing in marketing business today. Being the most cost-effective and widely reachable medium, it does the job for you. You can reach your prospects, market your offering and understand customer needs from anywhere at your convenience. With automating a few parts of this great tool, you can make it even more powerful and productive for your business. 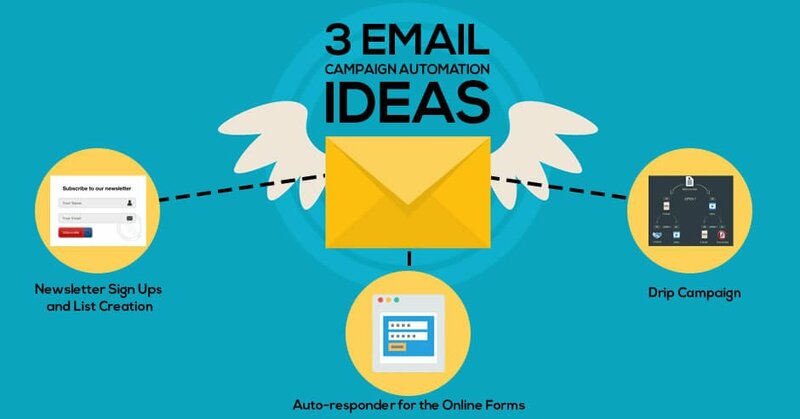 If you are wondering about what we are referring to, then let us just help you by explaining the three areas of email campaigns which can be automated to make your job a little easier. The newsletter is one of the valuable marketing tools used by organizations of all sizes because of its ability to efficiently engage with your target market. The more you reach as many people as possible, the more opportunity you get to expand. By sending a newsletter, you can easily stay in touch with customers and prospects on a regular basis which will never let your memory fade away from people’s mind. Though automating the process of sending the newsletter, small businesses can be sure of the fact that their subscribers will receive the content in time without fail which in turn will help them build trust and maintain loyalty with customers. What we suggest is that when you plan to leverage newsletter as your marketing tool, then you first need to think about the type of industry you are dealing with and based upon that decide the timings of your newsletter, like will it be quarterly or monthly. To activate newsletter subscription, you need to request for visitors’ email addresses and on receiving of which the new subscriber gets automatically added to your newsletter list. When automated, the list creation process becomes fast and more efficient. All the established big companies are increasingly introducing automation in their workflow, saving time and improving productivity. Most of the work being automated reduces their burden and hence they can concentrate on their objectivities and targets. Even though you are just starting your business, you can always choose to go with the industry trends and follow them to stand out in the crowd. To make your email marketing even more impactful what we suggest is that you automate your campaigns as much as possible so that you can also relax and spend more time on framing strategies. After newsletter, another area where you can add automation is the filling of forms on your website. An auto-responder, task assignments, and internal notifications initiate automated campaigns to inform your prospect on when a member of your team will contact them and through which medium like via phone or email, and even motivate them to sign up for your newsletter, follow you on social media and other public platforms. To give a start to your auto-responder, what you need to do is send a follow-up email immediately after the visitor fills up the form to let them know that their information has been received by your team. Filling up the form means that they are interested to know your company or brand more. Hence, make use of this interest and for that what you can do is add links to your social channels, blog or newsletter so that they are kept informed and entertained at the same time. And lastly, don’t keep your lead waiting for long. Try to revert to them as early as possible while your product is still in their mind. Small businesses often have to deal with different challenges and end up hindering how to cope with it. Automation in such scenarios serves as a savior, helping you come out of the fall fast. If you are one of them then what we feel is that you should go with having your first Drip campaigns also known as nurture campaigns or sequences which are nothing but sets of emails delivered at a pre-determined time or on the basis of a recipient’s interactions with your content. These emails help in nurturing leads and are useful in welcoming new subscribers, expecting referrals and more. Decorate your drip campaigns with engaging content, be it a blog, videos, datasheets, ebooks, infographics and other types of resources. Any content that has value to a customer can work for your business and mark the beginning of your company’s expansion. One of the vital advantages of marketing automation tools is that it allows marketers to track and calculate the performance level of their email campaigns. Using that data, they can review their subject lines, personalization, calls-to-action and content layout to rectify mistakes and come up with something better and interesting. Based on our understanding of the market, we came up with suggestions and information that can give a big start to your small business and help you in your long journey ahead.